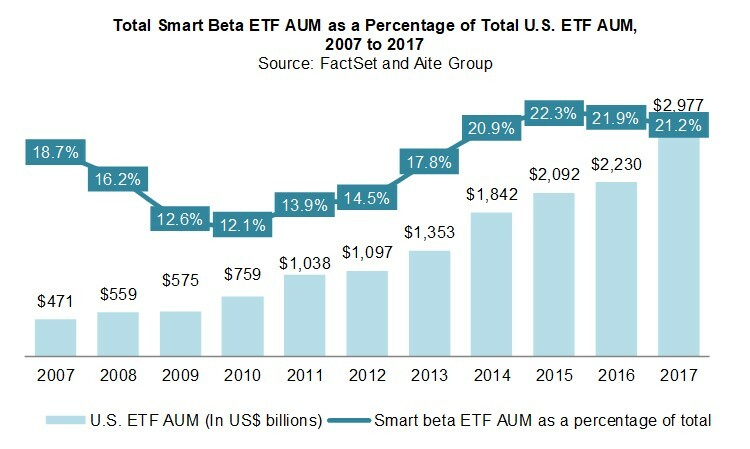 While smart beta ETFs are a small portion of the overall investment funds market, they have seen impressive overall growth. Boston, March 13, 2018 – One of the key new products at play when considering active versus passive investment styles is the suite of smart beta offerings, which use elements of both approaches. Although active managers have deployed factor-based approaches in the past few decades, only in the last five years has the industry seen an explosion in the popularity of targeted factor-based investment vehicles. After significant product development and marketing efforts, smart beta providers effectively doubled their efforts to sell these products to the investing public. This report identifies the most important aspects of smart beta investing and sheds light on the future of this investing style. It is based on data provided by FactSet as well as perspectives gathered from qualitative interviews with seasoned professionals since Q3 2017 at various organizations that have created, managed, researched, and distributed smart beta exchange-traded products across the United States. This 30-page Impact Report contains 11 figures and four tables. Clients of Aite Group’s Institutional Securities & Investments service can download this report, the corresponding charts, and the Executive Impact Deck. This report mentions Axioma, Bloomberg, BlackRock, Charles River, FactSet, Finastra, FIS, IBM, MSCI, Murex, NeoXam, SS&C Technologies, and Wilshire Analytics.